These past few months have been challenging for our family. My mom has been battling stage 3 breast cancer. She has been handling it like a champ though! She had her second to last chemo two days ago and has scheduled her mastectomy in December. Thankfully, her breast cancer is not the genetic kind, which is super awesome for my boobies! Still have to start getting mammograms in a few years. And to top it off, our 13 year old beagle got pancreatitis last week! So, between taking him back and forth to the vet, we have been exhausted! But he is doing better now and getting spoiled! He now gets food cooked by me and thinks he is King of the House. With all of this going on, we had a Thanksgiving party last week. I decided to make Sangria for the first time. It was such a hit, that a couple of people asked for the recipe! Put the fruit in the bottom of a pitcher. I didn’t have a pitcher, so I used a large cooking pot. 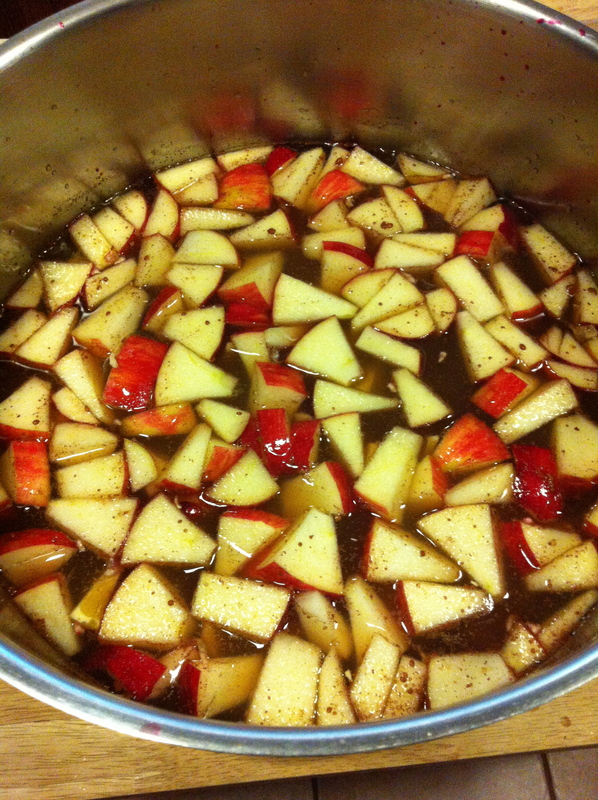 Next, add the cinnamon sticks, carbonated water, wine, cinnamon, cider, and honey. Last, add the liquor! Start with 1/2c and then add as much or as little as your like! I let mine chill for about 9 hours. It needs to chill for at least 2 hours, but the longer it chills, the better it gets! Next time I make this, I will have to make a double recipe! I have been obsessed with this recipe recently. I make it every two weeks! Super easy and pretty quick for a crock pot recipe! Line the crockpot with the crockpot liner. Pour the broth in. Then put in the chicken, mushrooms, and shallots. 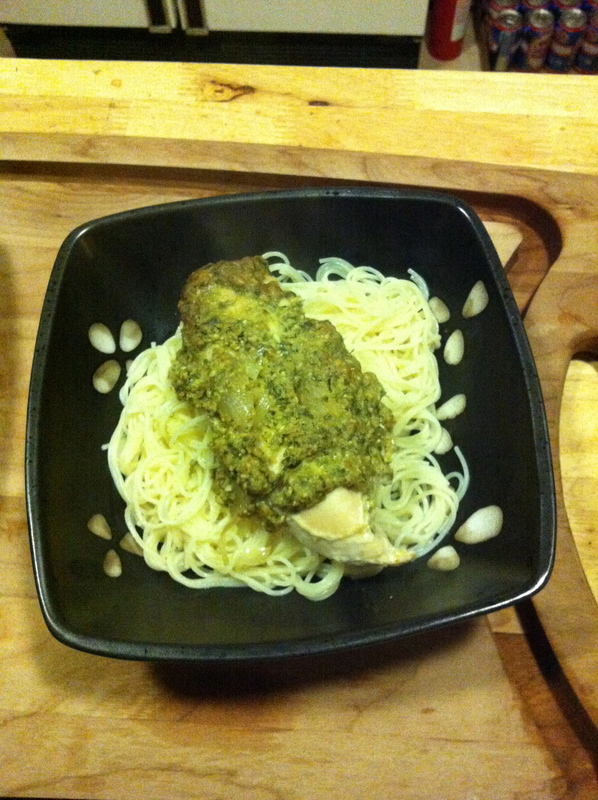 When it comes to putting on the pesto, I spread it on top of the chicken breast. Put the lid on, cook on low for 4 hours, or high for 2 hours. Yep…you read that title correct! I make Turkey Chili Stew. I used to call it chili, but when I would describe it to people, it was decided that it was more of a stew because of all the vegetables that are in it. 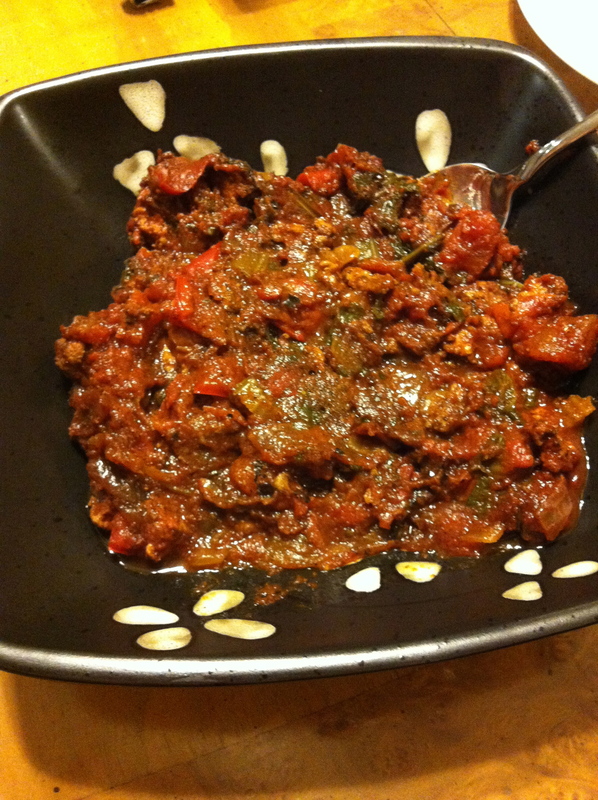 Call it chili, call it stew…doesn’t matter because it is so tasty! First brown the turkey in a pan. 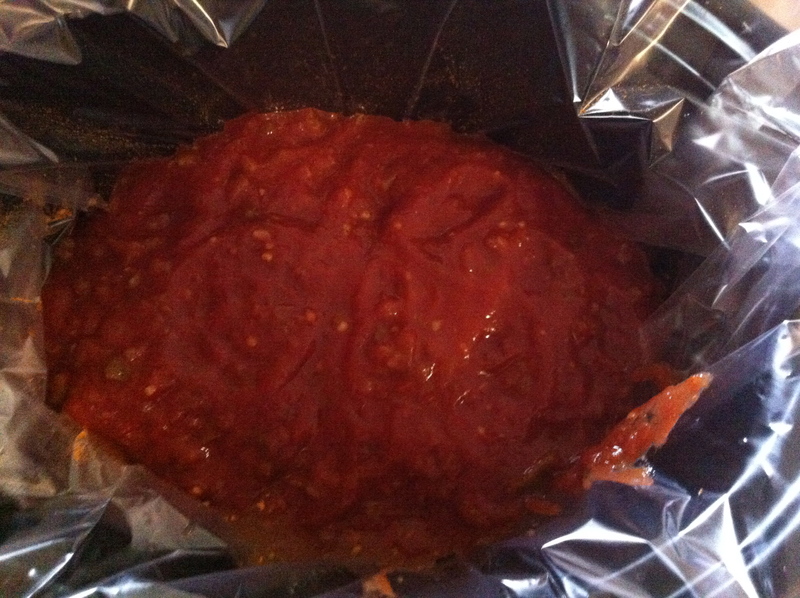 Then you can line your crockpot with a crockpot liner. 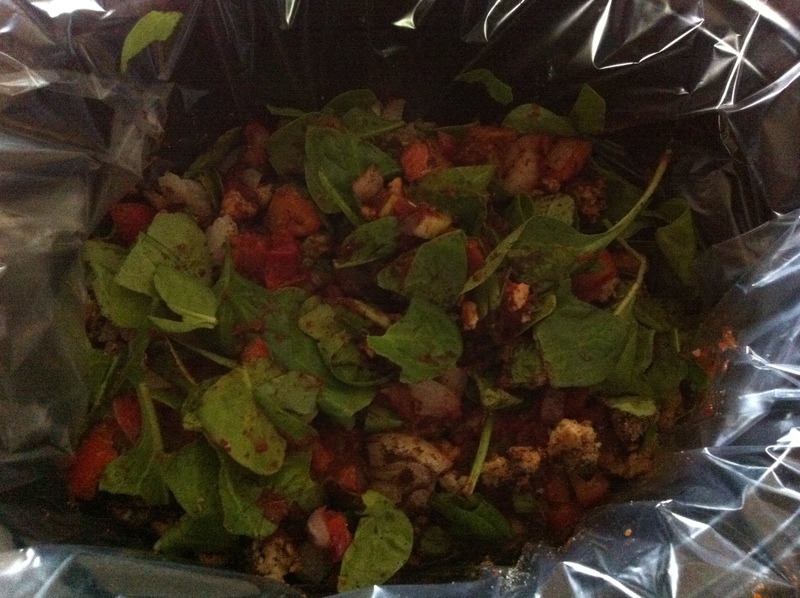 Add all of the ingredients to the crock pot except spinach. Add spices to the mixture. Now add the spinach on top. Cook on low for 7 hours. Stirring occasionally. 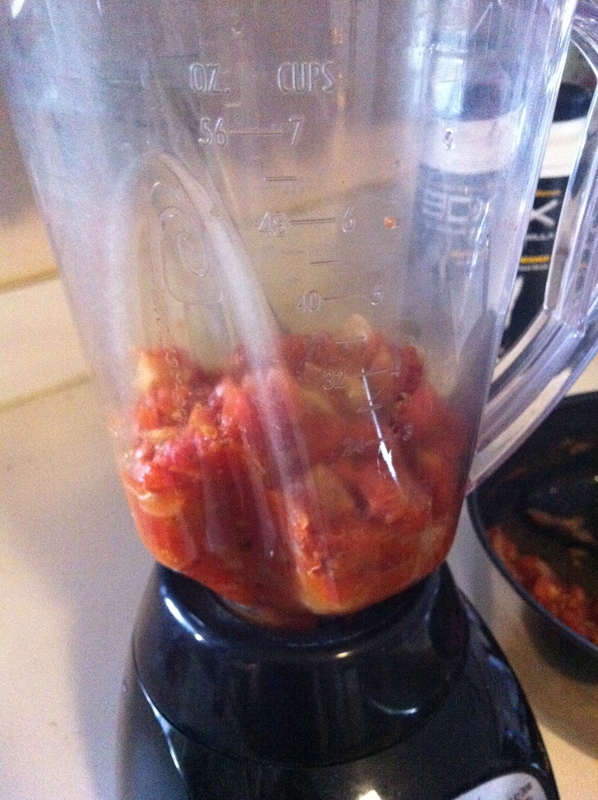 Seven hours later….your house smells like chili. It’s the perfect comfort food on a cold day. Unfortunately, the picture does not do it justice. 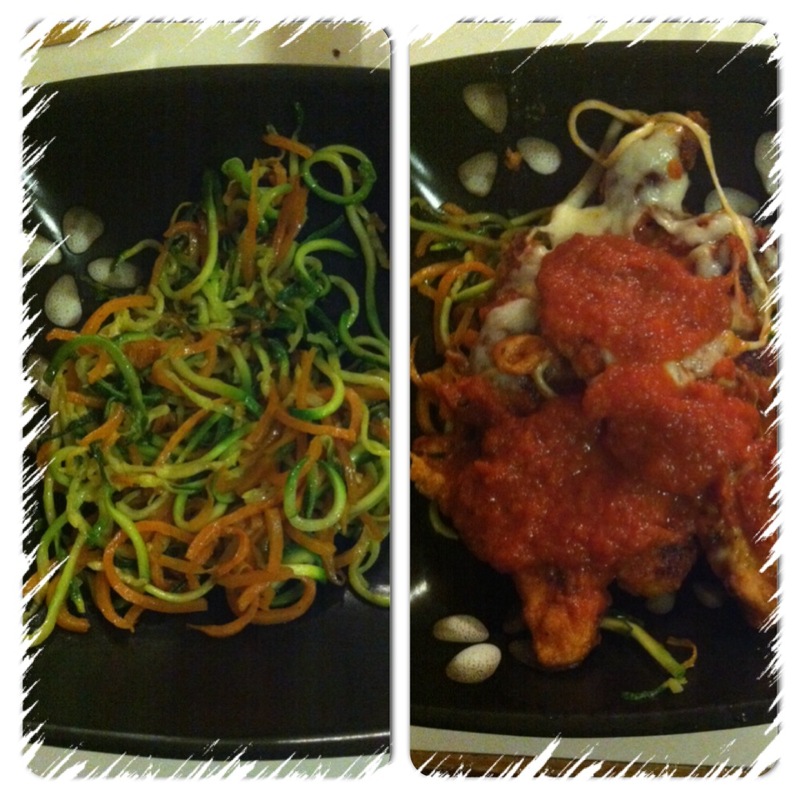 I know that it isn’t very pretty, but it is delicious and very healthy! 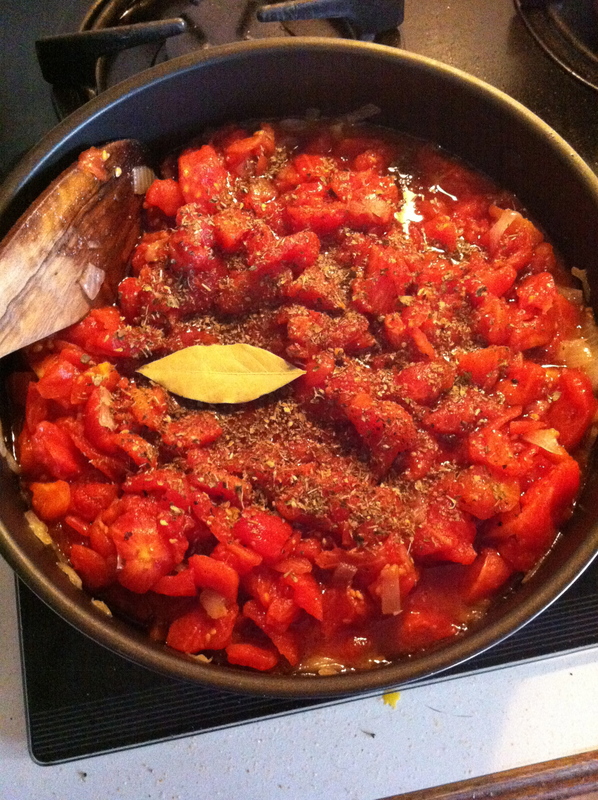 Like I mentioned in previous posts…..we LOVE Italian food! And our favorite dish at Italian restaurants is Chicken Parmesan. I like to try different dishes on the menu, but Trip…he stays with the classic. He will order Chicken Parmesan and I will try something new, and his dish is always better. Since we love this dish so much, it only makes sense that I make it at home, but only a bit healthier. Normally in restaurants the chicken comes in a single breast. I like to cut the chicken into pieces and then bread it. Open the eggs for an egg wash in a bowl. In another bowl, put your almond flour and spices in. Mix the flour and spices. Dip the chicken into the egg wash and then put it in the breading. I typically use my left hand to mix the chicken in the eggs, drop it into the breading bowl and use my right hand to roll the chicken in the breading. 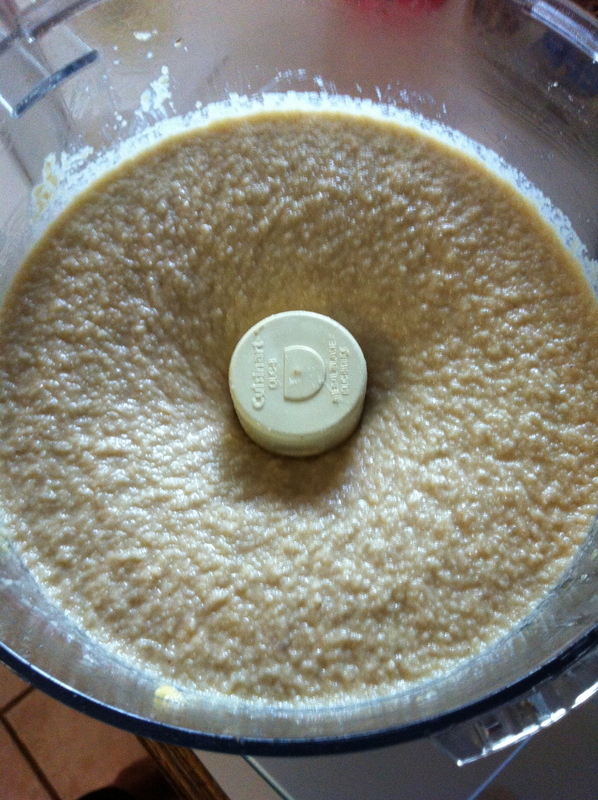 I have found that this will help keep excess egg into the breading and it won’t get as many clumps. As you can see, there isn’t a ton of flour on the chicken. A lot of restaurants will have pounded the chicken so thin that some bites are just breading. 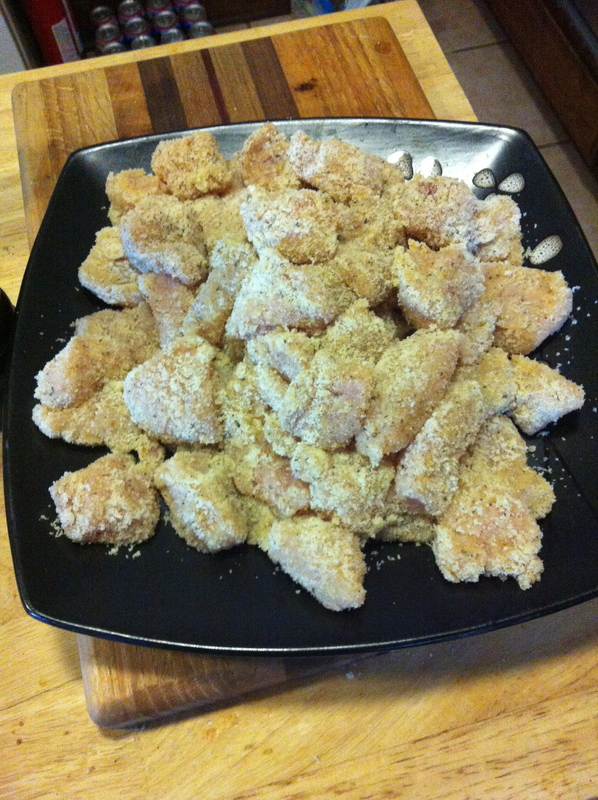 With this thin coating of breading, you get the taste and the texture of the crispy breading. Next, you will use a medium pan and put a tablespoon of coconut oil in. You will sear each side of the chicken for 1.5-2 minutes on each side. 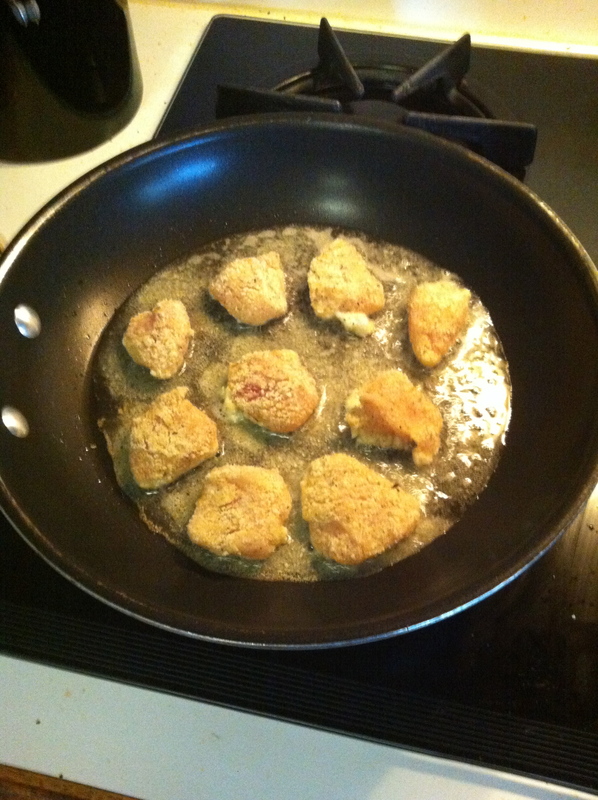 (As you can see, I don’t deep fry my chicken.) You want a nice golden color on the chicken. It’s ok if it isn’t cooked all the way through, we will be baking it in a few minutes. You can get your baking dish ready while the chicken is cooking. 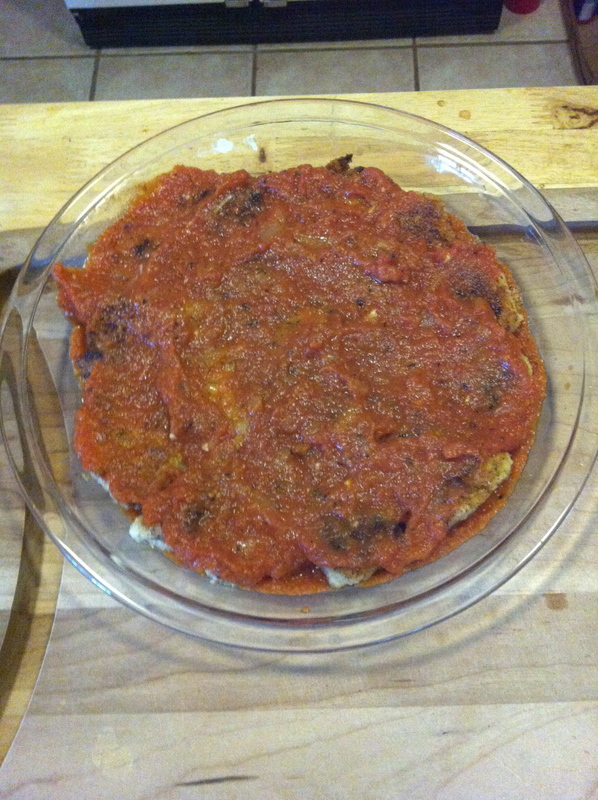 I start by putting a layer of marinara on the bottom. I like using the marinara recipe I posted earlier. Then once the chicken is done searing on both sides, put it on a paper towel to drain off excess oil. Next you can start putting it in your baking dish. 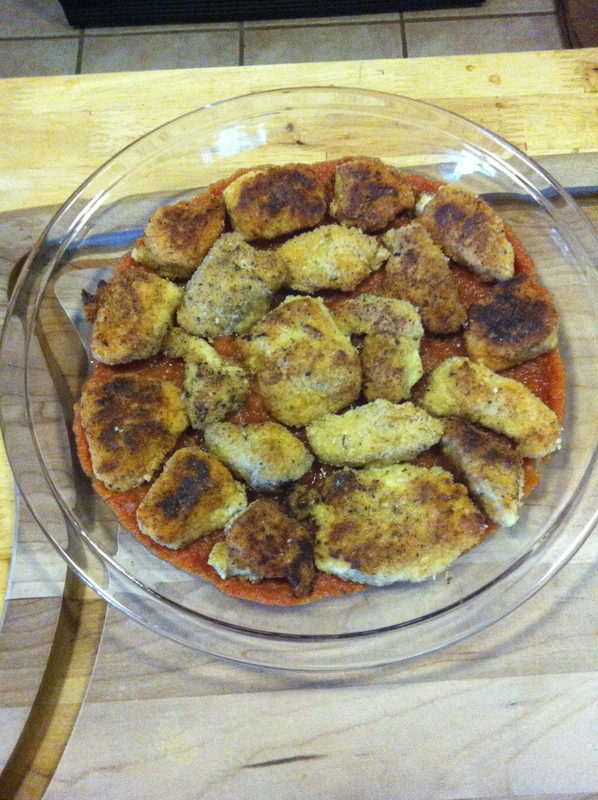 Once it is full of chicken, put another layer of marinara over the chicken. Bake the chicken for 20 minutes in the oven. Once that has finished cooking, put as much mozzarella as you like over the dish. And cook until cheese is melted, about 7 minutes. You can serve this over pasta, zoodles, sweet potato noodles, or quinoa! Or just eat it plain. Anyway you have it, it tastes amazing! We love Italian food. If I thought that we could get away with eating it 4 time a week, we probably would. I used to buy marinara. One jar for $2 didn’t seem like a bad buy. But….when you use a jar and a half when making Chicken Parmesan (our favorite meal next to Pizza) you start to wonder if there if making it yourself is better in the long run. Once I started making it at home, we haven’t gone back to using the store bought kind. It doesn’t take as long as you might think. 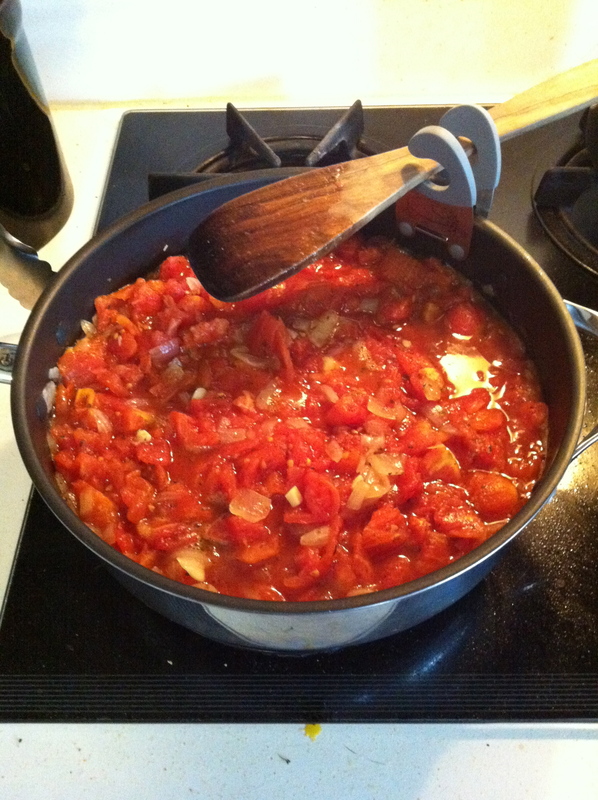 If you have an hour, you can make this super simple marinara. 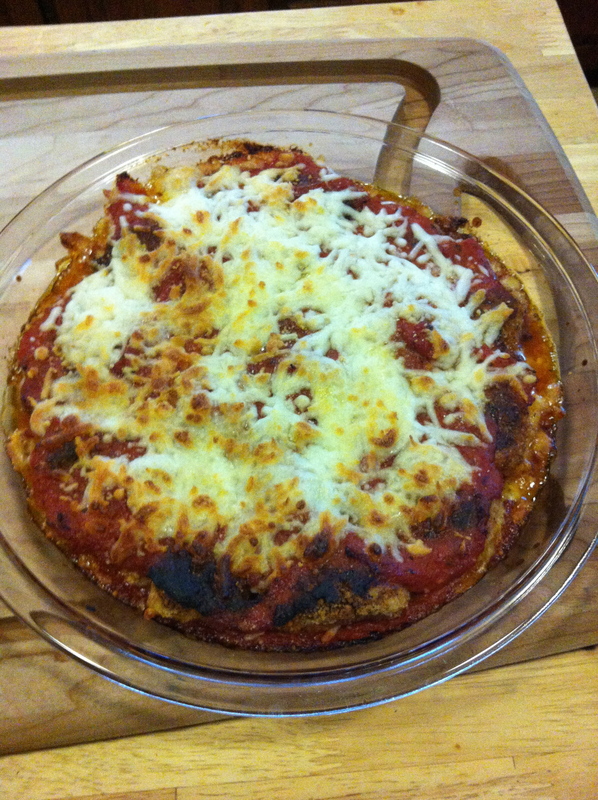 This recipe was found when Virginia is for Hunter Gathers did a guest post on Nom Nom Paleo. Heat 2 tablespoons olive oil in a skillet (I use a deep sided skillet so I only have to use one pan for this) over medium-low heat. Add in your onions. I like to caramelize the onions a bit to add some sweetness to the sauce. 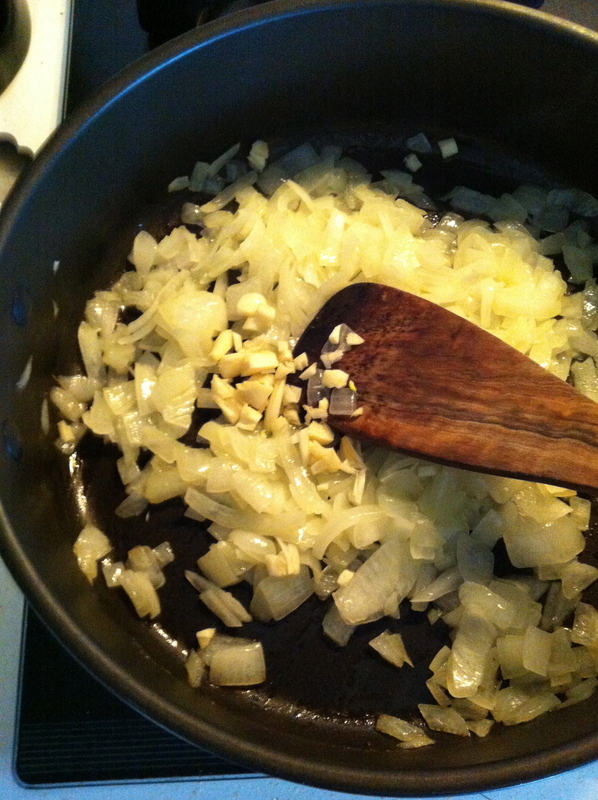 If you find that the onions are starting to burn instead of caramelize, add a bit more olive oil. If you don’t want to caramelize the onions, cook them until they are translucent. While the onions are cooking, you can prepare the garlic. The easy was to do it is if you have a garlic press. I don’t have one, so I cut it by hand. When you add in the garlic, cook it for about 3 more minutes. 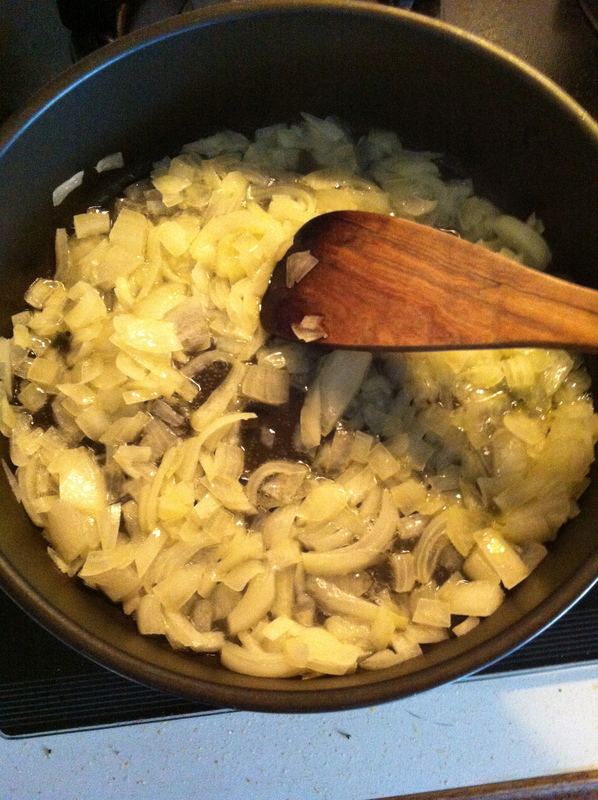 Once the garlic has cooked with the onions, you can add the rest of the ingredients. (If using fresh basil, put half of it in at this point) If you don’t have a deep sided skillet, you can use a large sauce pot. Simmer uncovered for 45 minutes to an hour stirring occasionally. If the sauce starts sticking to the bottom of the pan, turn down the heat. Remove the bay leaf and add the rest of the fresh basil if using. The sauce could now be used if you like a chunky sauce. I don’t. So I put it in the blender. 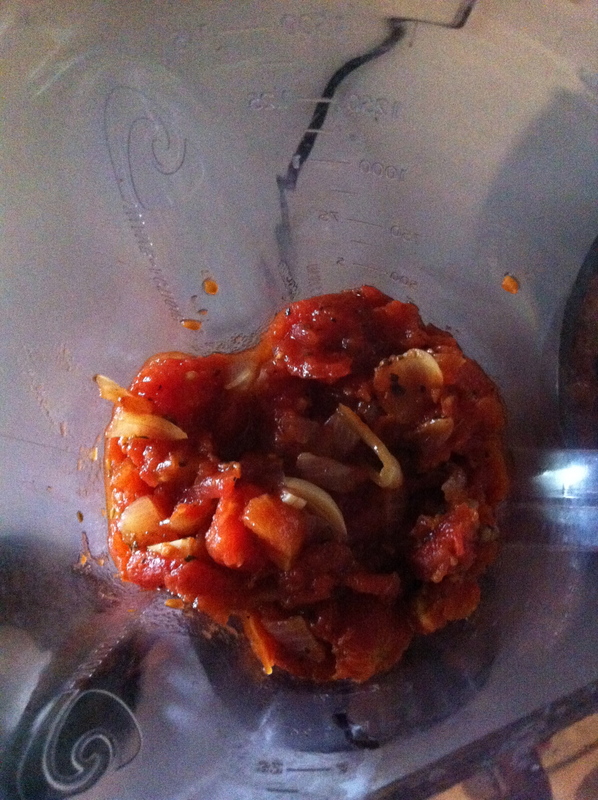 Blend it until you get the desired consistency. I like my sauce really smooth. So I will blend it a bit more. Once you have the consistency you like, you can eat it or store it! This sauce is so tasty! I have had several people tell me that they can’t believe that it is homemade. I am so grateful that I found this recipe. It has become a staple in our house. Hopefully it will become one in yours too! It was hard to not get inspired when trying these different treats. 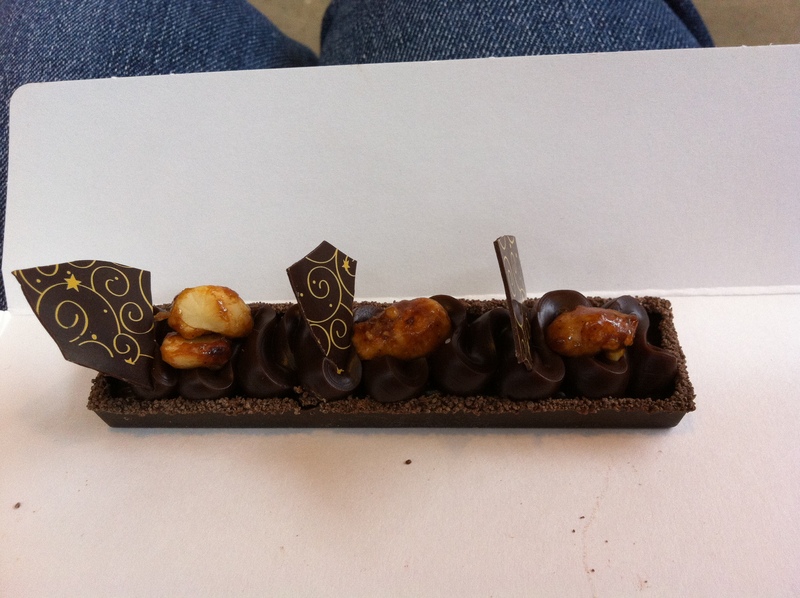 Like this Snickers bar! Wish I could make this! Last week, I got this great idea. I have been snacking on Bark Thins lately. I was like, “I can do this!” All I have to do is melt chocolate and put nuts in it and I am good. Right? 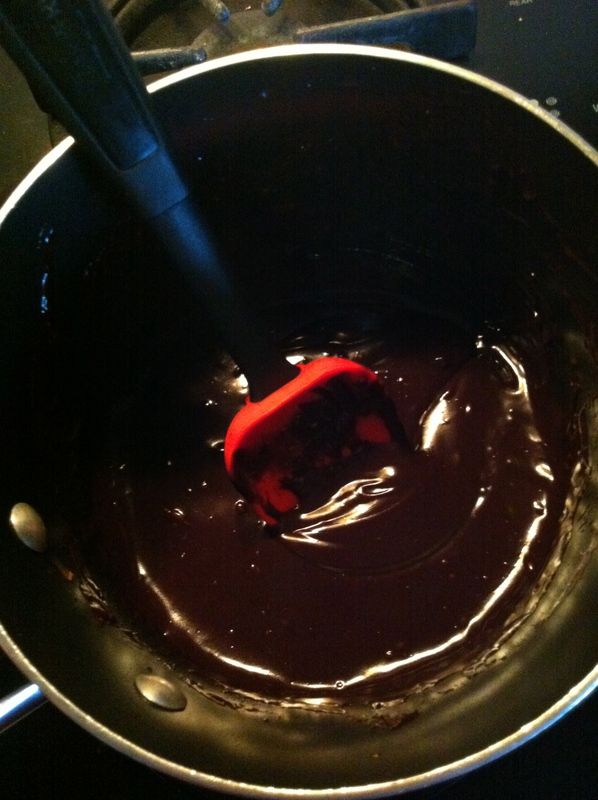 Sounds so easy in theory……..
First thing is to melt the chocolate. You are *supposed* to do it using a double broiler. 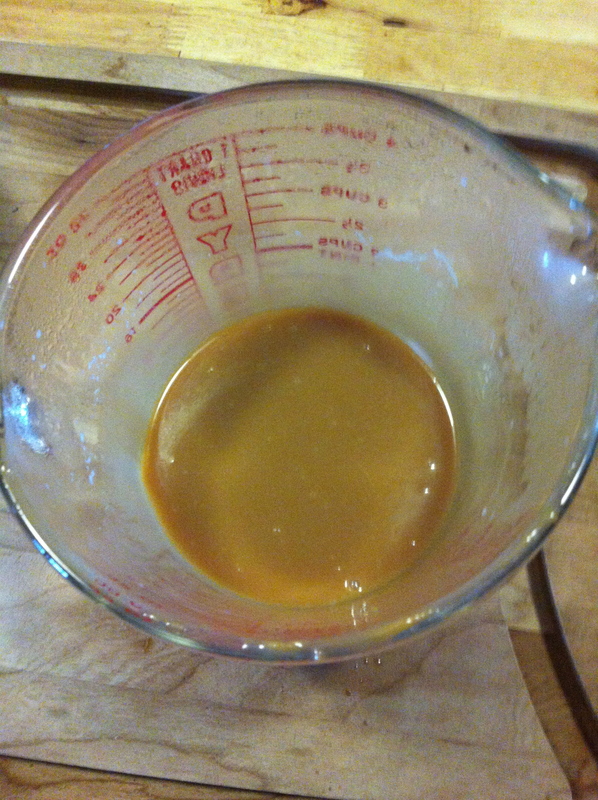 BUT…..since I don’t have one, I just melt it on really low and constantly stir. Place chocolate, butter, vanilla, and almond milk in a pot. Put on low (or use a double broiler) and constantly stir until melted. Sprinkle sea salt over the chocolate. Put in freezer until the chocolate is set. Which is about 45 minutes. 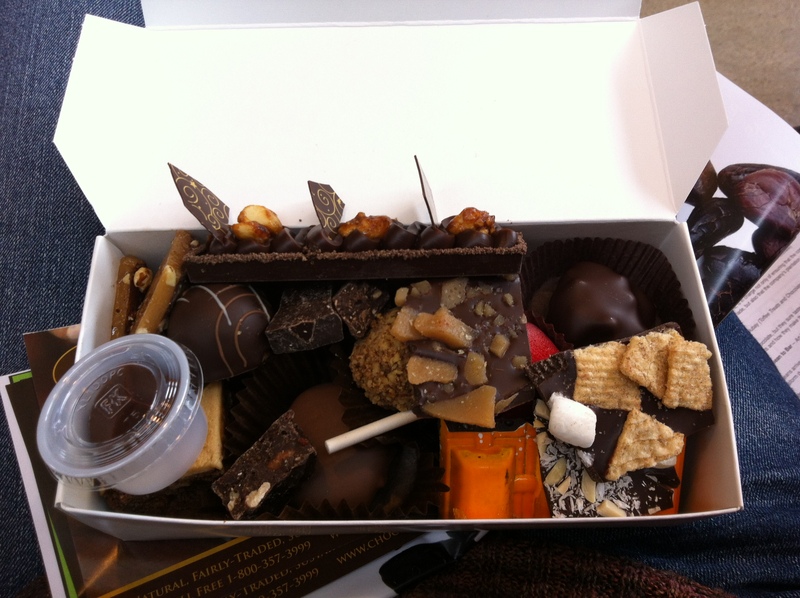 Using a sharp knife, cut the chocolate. Store the chocolate in the fridge or freezer. It needs to be kept cold when not eating it, or else it gets really soft. 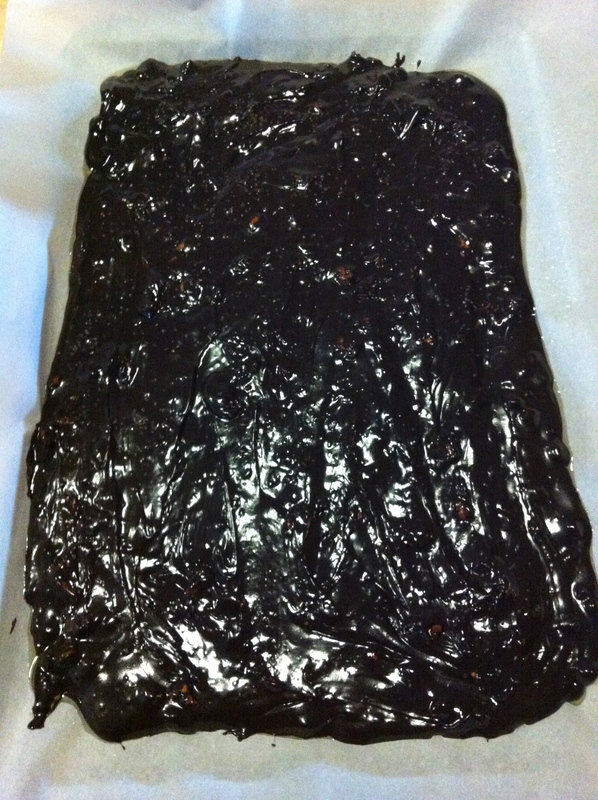 As you can see, the chocolate pieces are not thin like the Bark Thins. However….they taste amazing! I liked how soft they are even with being in the freezer. I still store mine in the freezer. It did not harden up like you think it would. You shouldn’t cut them in really big pieces though. It tends to be rich, even though it was dark chocolate. 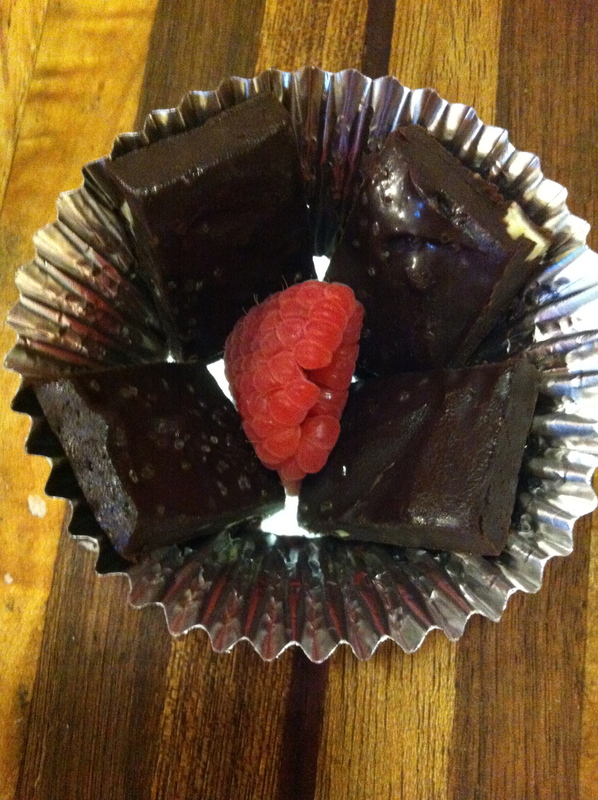 The salt does help cut down on some of the sweetness while enhancing the chocolate flavor. Just one of these squares hits the spot for me when I have a chocolate craving! It has even been approved by several people at work and by the boyfriend! Hope you enjoy it too! 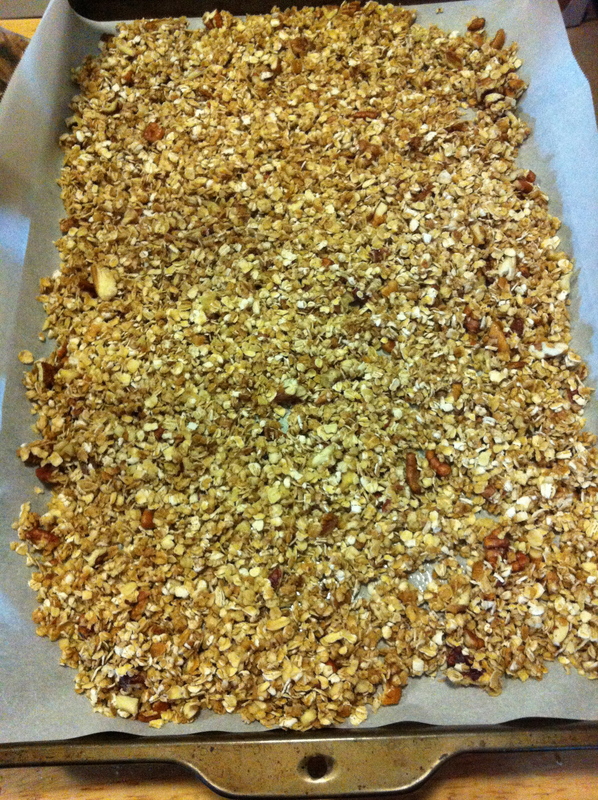 One of my niece’s favorite things I make for her is granola, or “Aunt Amy’s Granola” as she calls it. 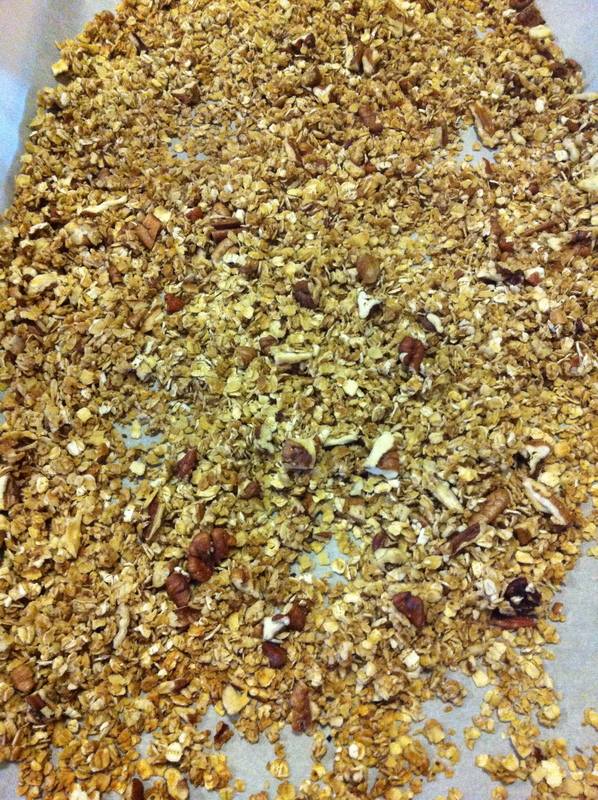 Some people think that it takes a long time to make granola, but really is only takes about 30 minutes, including prep time! 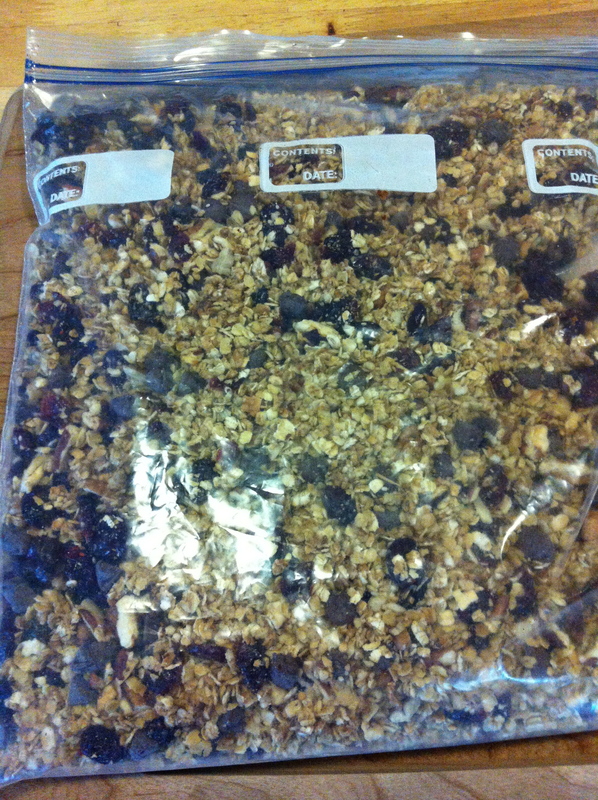 What I love about making granola is that I can decide what goes in it! 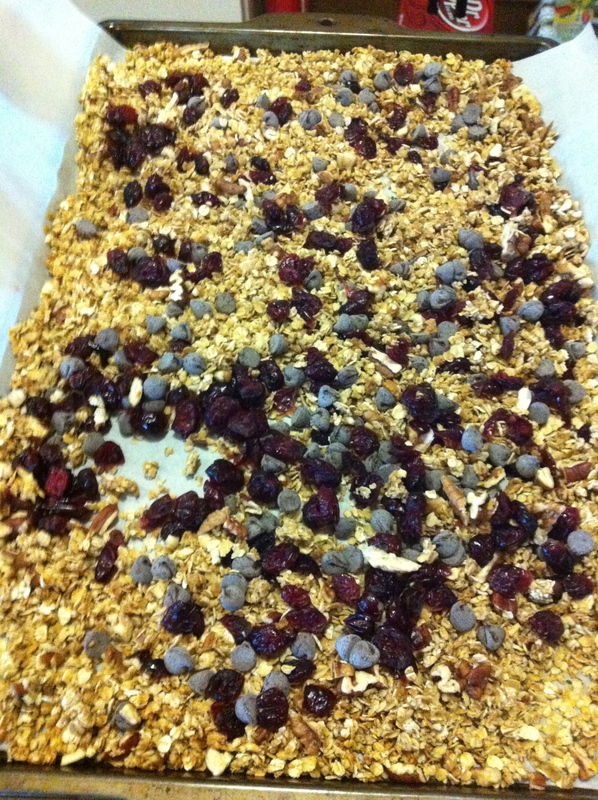 Dried cranberries, dried blueberries, coconut flakes….you name it! The possibilities are endless! Put the oats, brown sugar, and pecans in a large bowl. Add the vanilla, olive oil, and water. You want the mixture to be slightly damp, but not soaked. 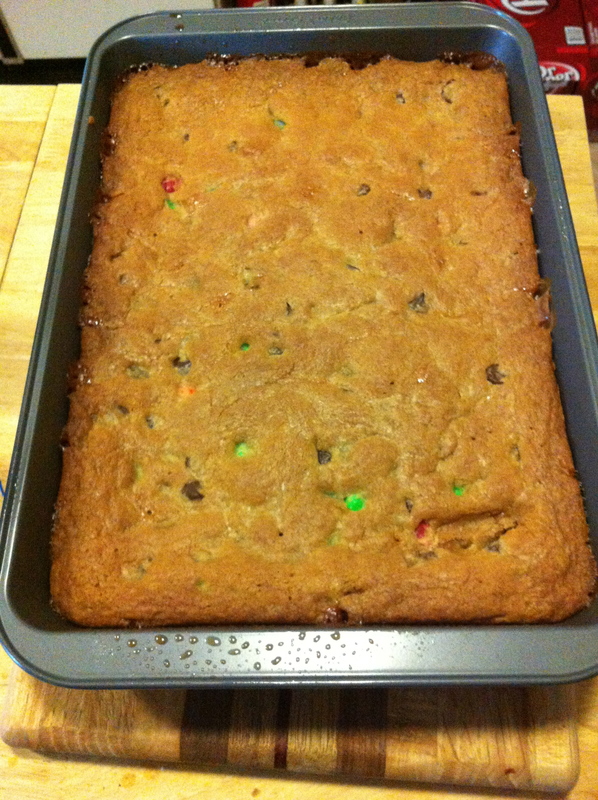 Then spread out on a cookie sheet. Bake for 10 minutes. Stir it around and then bake for another 10 minutes. If after 20 minutes, it is dry, you are done! If not, bake it for 2 minutes at a time until it is dry. 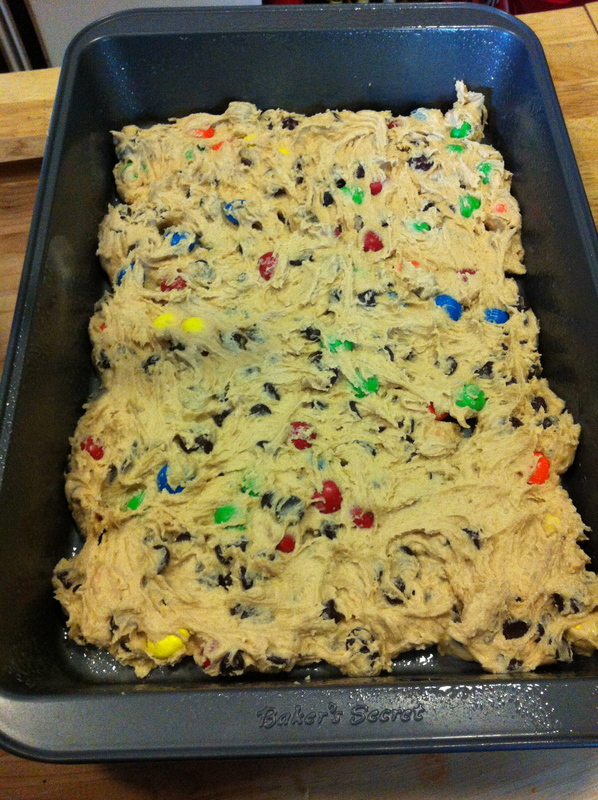 Once cooled, you can add the chia seeds, dried fruit, and chocolate chips. 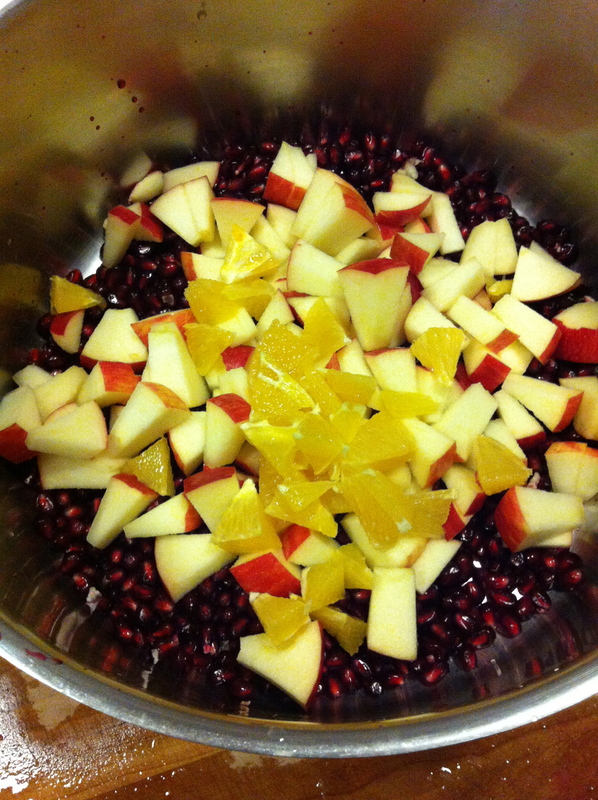 Add in your fruit and chocolate! I will store mine in the freezer so it lasts longer. However, from what I have heard, when you have a five year old at home, it doesn’t last long! 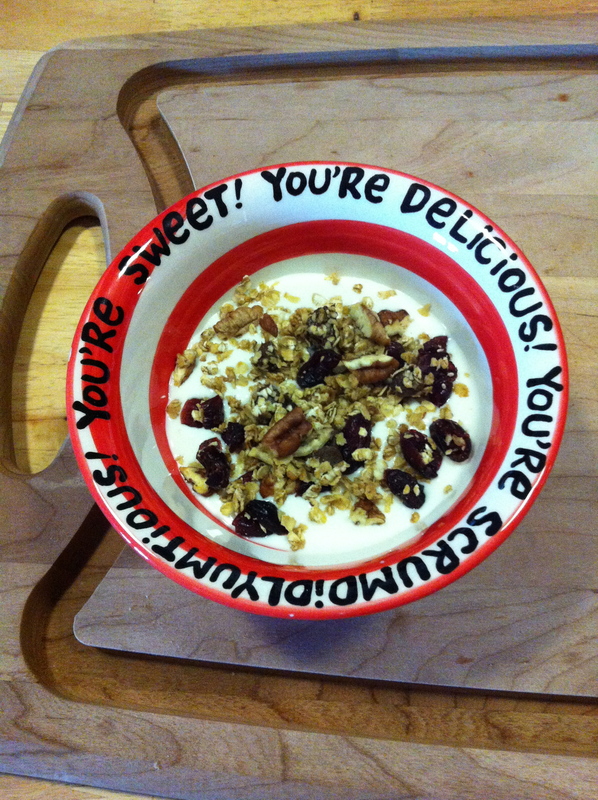 I think the bowl says it all! Yep. you read the title correct. I made Nut Pie. I can not take credit for the naming of this dish. I have been making it for several years. I found the recipe here on Pinterest. 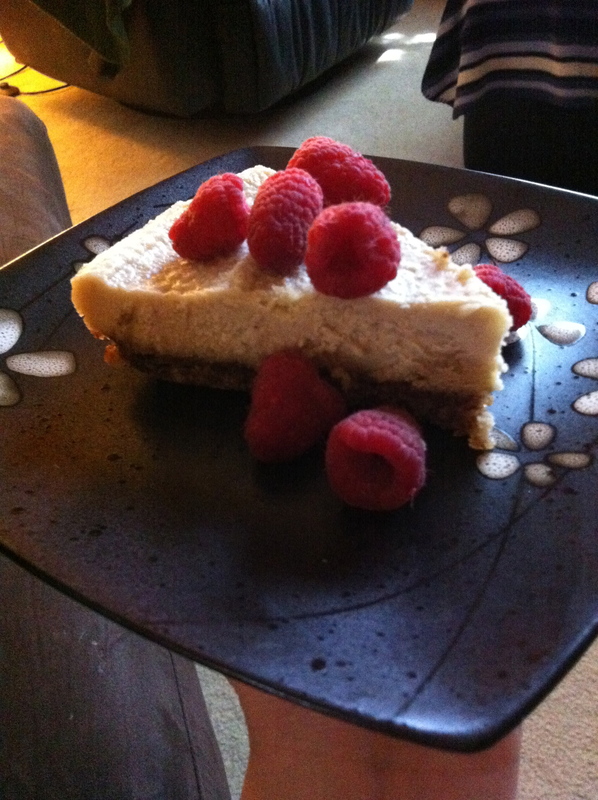 To me and my Paleo friends, we call it “Cheese-fake cake”. But Trip HATES it when I call it that. Something about “it’s not a cake” and “there isn’t any cheese in it”. Well, DUH! That’s why it’s called a “cheese-fake cake”! Moral of the story is….this will now and forever be called “Nut Pie”. You may ask….why is this called “Nut Pie”. Well….it’s made 90% of nuts! Sounds about right for a pie that is called Nut Pie. First thing is to soak the cashews in water overnight in the refrigerator. That’s easy. This makes them blend up nice and creamy. 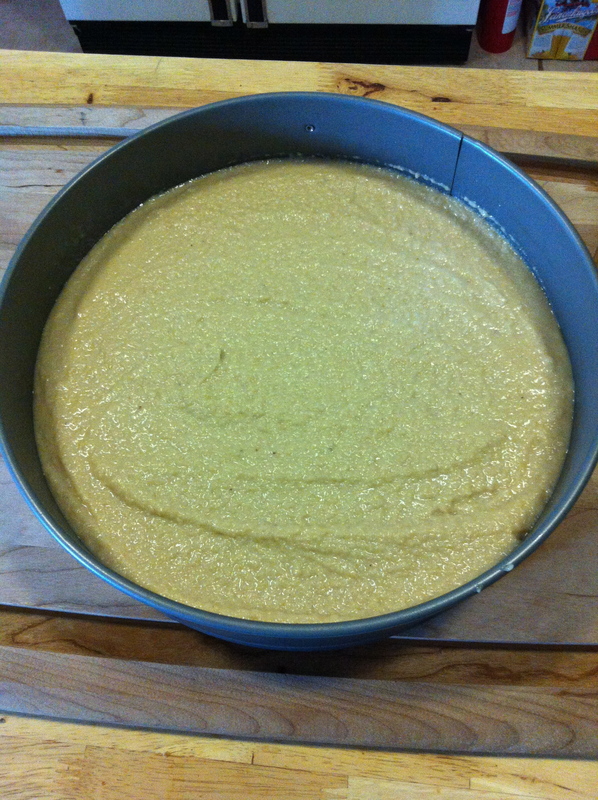 Now that the cashews have been soaked, you can make the crust. Preheat the oven to 350 degrees. Take all the ingredients and put in your food processor. Pulse until all the ingredients are well mixed. Then press them into an 8in springform pan. If you don’t have one, it’s ok. You can use a regular pie pan. Make sure that you grease the pan before putting the crust in so it doesn’t stick. Put crust into the oven for 10-14 minutes. You want to make sure that the crust is set. While the crust is cooking, you can make the filling. Drain the water from the cashews before putting them back in your food processor. I like the blend the cashews by themselves for about 30 seconds. Add the rest of the filling ingredients. Blend until smooth and creamy. 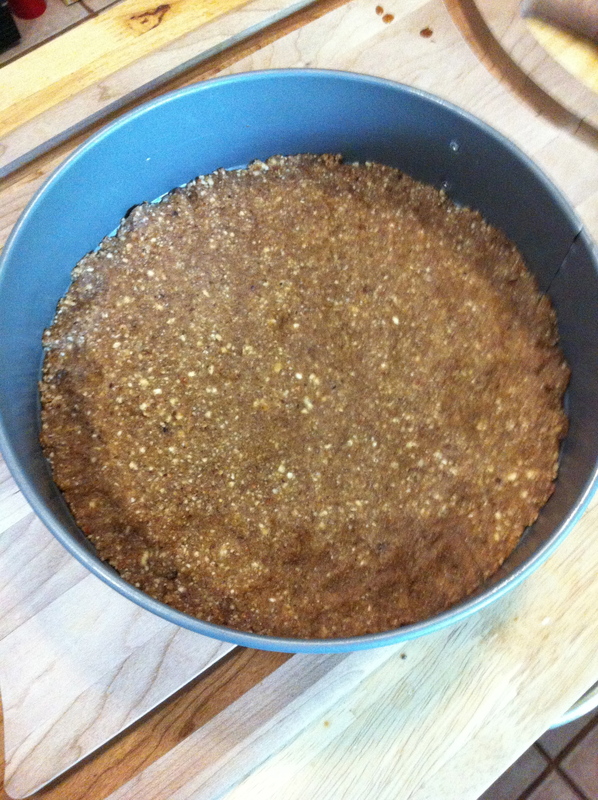 Make sure that the crust is cooled before you add the filling. Put the Nut Pie into the freezer for at least 4 hours. Remember to take the pie about 30 minutes before you want to eat it. Slice the pie and enjoy! You can add fresh fruit, chocolate sauce, or just eat it plain. 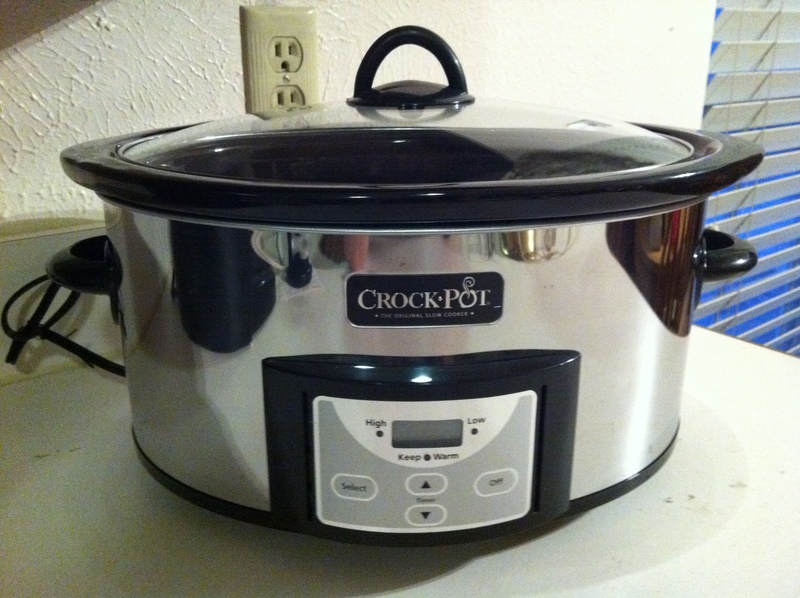 For the longest time, I swore off buying a Crock-Pot. Part of me was scared to leave a cooking appliance on while I was at home. The other part of me thought I was buying lazy by just putting something in a Crock-Pot and not doing anything. 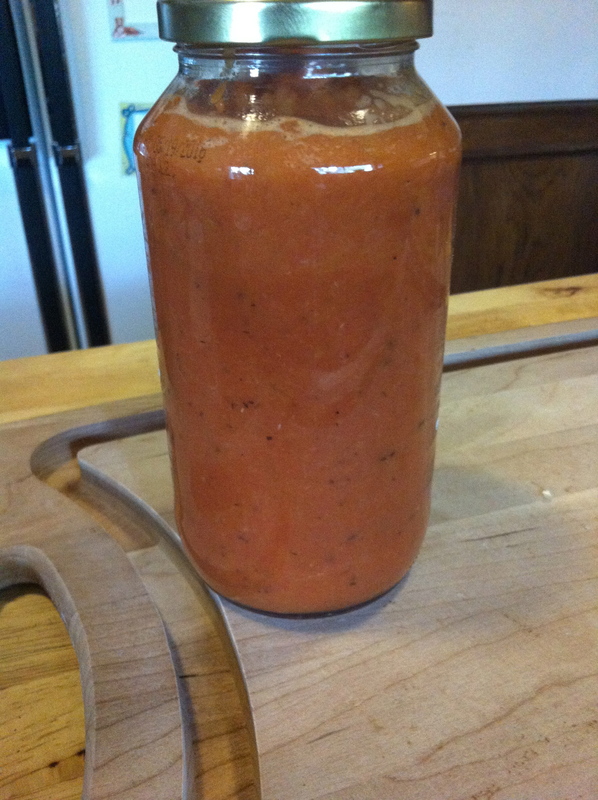 Two years ago, my boyfriend’s brother bought me one for Christmas….and it is one of my favorite kitchen appliances. 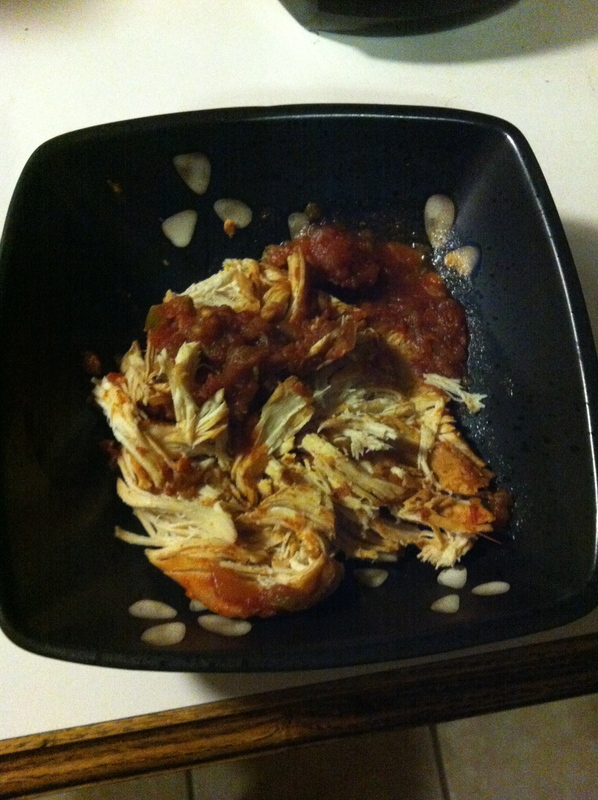 Since getting this awesome Crock-Pot, one of our favorite meals is Salsa Chicken. It’s super easy and great for leftovers! I usually make this before my work weekends so I have lunches already made. In fact, I have made it so often for work lunches, one of my coworkers Kim requested that I blog about this recipe! Well, here ya go Kim! First thing to do is put your Crock-Pot liner in your crock pot. 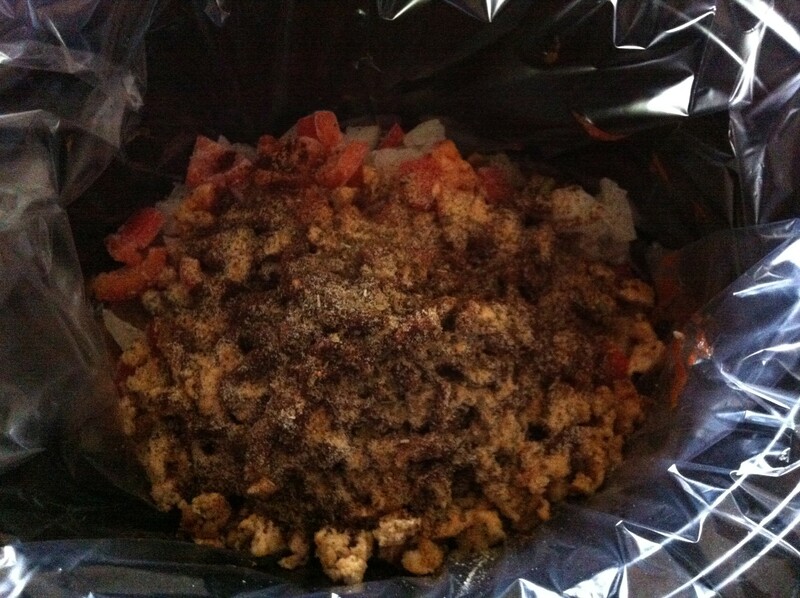 If you have never used, or heard of a Crock-Pot liner, you need to go to Wal-Mart and buy them now. They will save you SOOOOO much time when it comes to clean up. This will save you from having to scrub the crock pot when you are finished cooking. 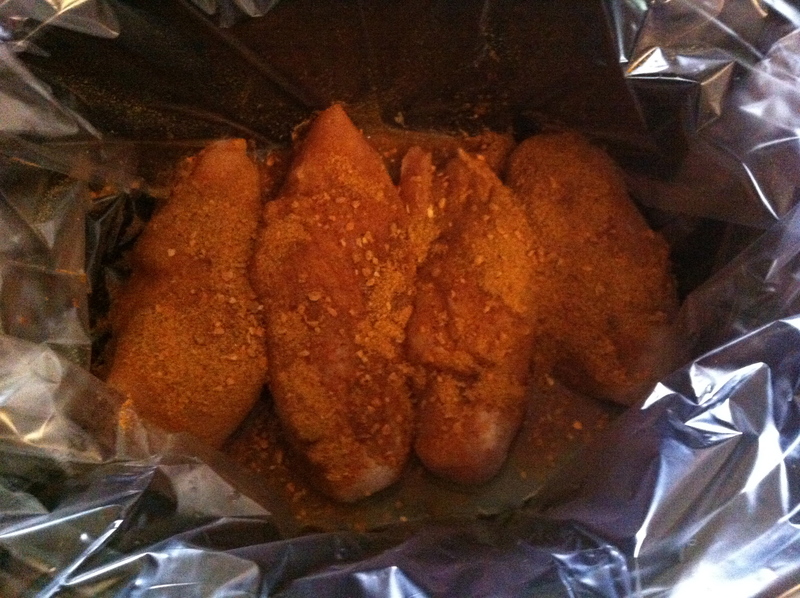 Put your thawed chicken breasts in the bottom of the crock pot. Squeeze the entire lime over the chicken. 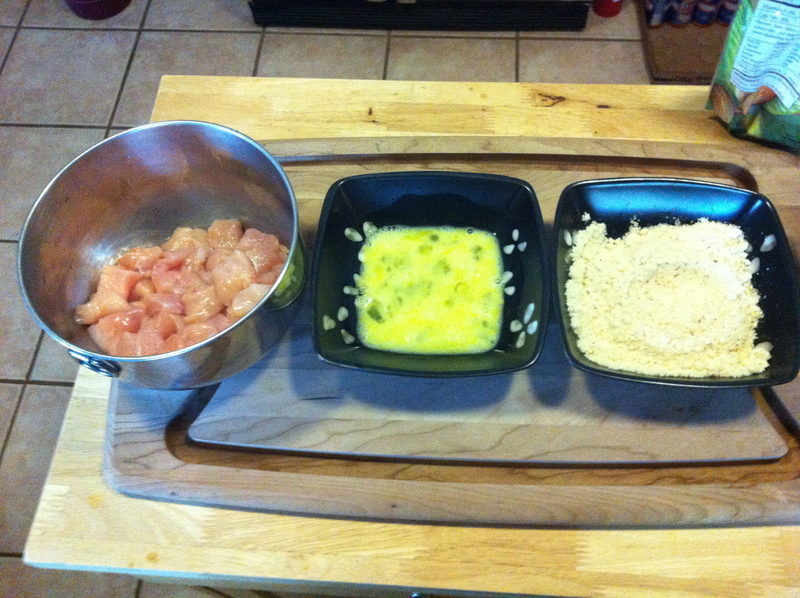 Once you put the lime juice over the chicken, now spread the taco seasonings over the chicken breasts. Now, pour the salsa over the chicken. You want to make sure that the chicken is fully covered with salsa. With the salsa on, you can add the chopped peppers if you want. In not, put the lid on the Crock-Pot and cook on low for 7 hours. 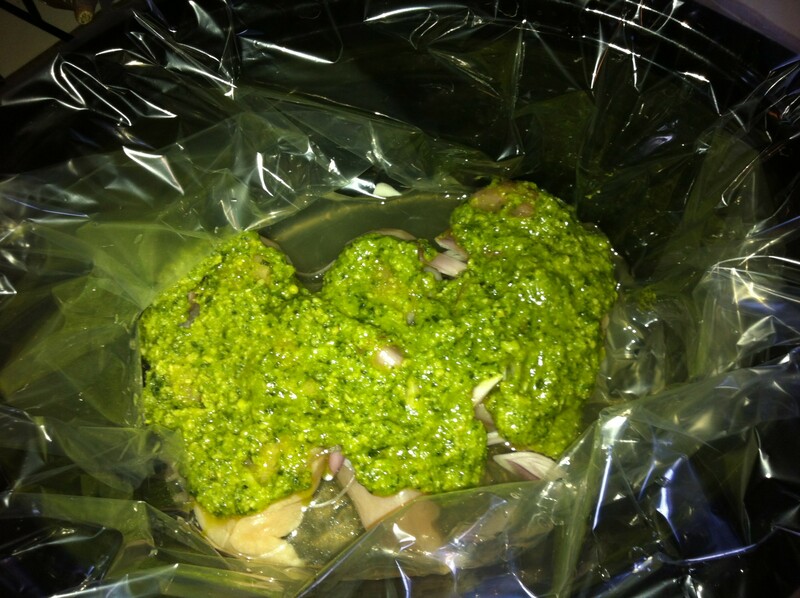 You have flavorful chicken that is able to be pulled apart and eaten for dinner. Like I mentioned earlier, you can put it on a taco salad, put it over rice, or just add a bunch of the salsa sauce from the Crock-Pot and eat it by itself. Whatever you decide to eat this with it will be amazing that night or the next day for lunch! Enjoy! Chocolate Chip Peanut Butter Caramel Awesomeness! I have made this for several parties (including a dinner party I am going to tonight), and everyone who has tried it has loved it, so I know you will too! Preheat the oven to 350 degrees. Spray a 9 x 13 pan. Cream butter and sugar together. Then mix in the eggs and vanilla. Make sure all the wet ingredients are mixed well. Slowly add in the baking soda, salt, and flour until it is all mixed. 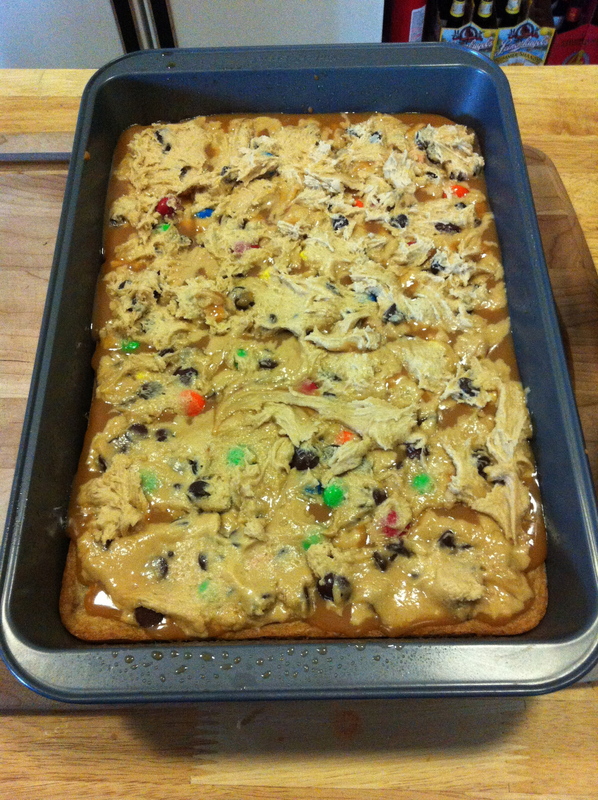 Stir in chocolate chips and peanut butter M&Ms. 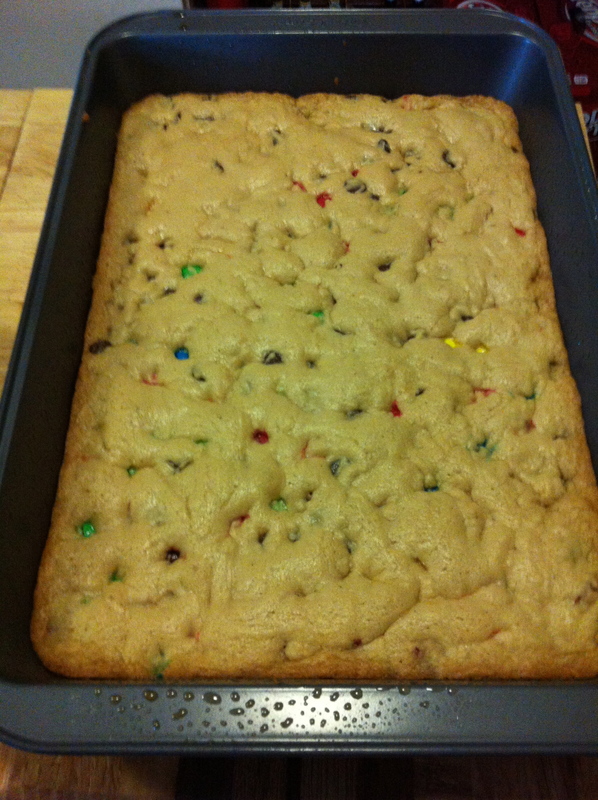 Take 2/3 of the batter and spread it in the pan. Now this can be messy!! A little tip is to spray your hands first with the cooking spray and then use your hands to spread the dough out. You will bake this for 8-10 minutes. You want the dough to set, but not golden brown. Now that the first part is finished baking, you can work on your caramel layer. Take your unwrapped caramels, put them in a microwave safe container with the milk. Microwave for 1 minute at a time. After each minute, stir. Keep doing this until all of the caramels are melted. Should take between 2-3 minutes. 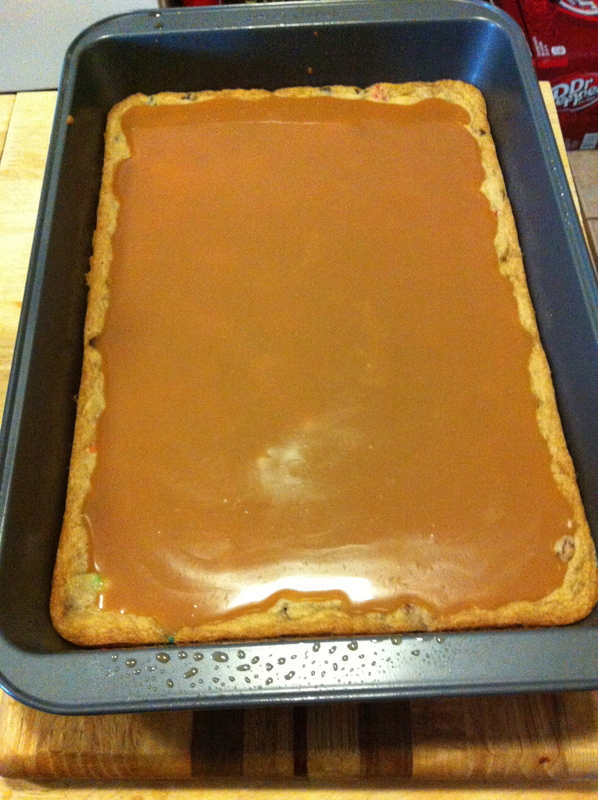 With the caramel melted, gently pour it over the dough in the pan. With the last of your dough, you will cover all of the caramel as best as you can. It might not be perfect, but that doesn’t matter. The dough will spread. Try not to leave any major holes. Put the pan back in the oven for 15-20 minutes. Now you do want it to be golden brown this time.